April 26, 2015 May 30, 2015 / Josh Dragon, P.E. It was another beautiful day in the Sierra’s. Not a cloud in the sky and the surrounding mountains were perfectly reflected in the glassy surface of the lake resting in the valley below. The sounds of tourists exploring the mountains echoed off the surrounding granite walls. They sounded happy and excited, completely unaware of the epic battle I was currently engaging in with one particular cliff on that mountainside. I was forty feet above the ground and desperately trying to control my breathing so my leg would stop shaking (a phenomenon rock climber’s call sewing machine). The tips of my fingers were delicately hanging onto two small edges protruding from the face of the cliff. Every second I refused to continue on increased the burning sensation in my forearms from the lactic acid. A body length above me was my salvation. A hole in the rock that I could get an entire hand into. Between me and that hole were some very small edges. As I had done over twenty times before, I lunged desperately for that next hold. Three of my fingers closed around it and for a split second I thought I would be able to hold on. Then the lactic acid finally took over. My hand opened up and the all too familiar sensations of falling engulfed me. The wind rushed around me for what seemed like an eternity. I could hear myself yelling, a weak attempt to control the fear. Twenty feet later and the rope snapped to attention like a soldier whose drill sergeant just walked into the room. My rapid decent immediately ended and I was sucked like a magnet into the face of the cliff. Oooff. I hung in my harness as my partner lowered me back to the ground and tried to collect myself. My body ached all over from taking that fall so many times over the last few months. I wondered if I would be able to find the will to try again. It had been a summer of apparent failures. What was the point? 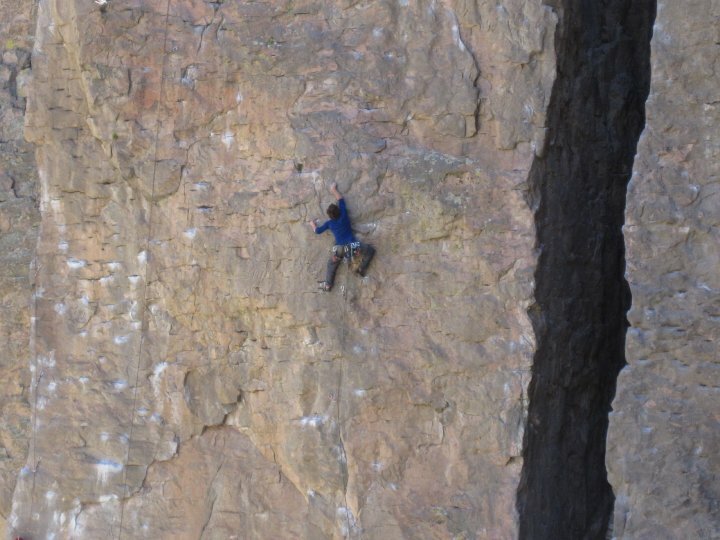 I was not feeling any stronger and was not sure I would ever be able to hang onto that hold. The worst part was my original partner had already completed the project a week earlier and moved onto a bigger and harder route. I was left to flail in my defeat, inabilities, and doubts. Have you ever felt like I did? When we take on entrepreneurial efforts there are tons of opportunities for the fear of failure to overwhelm us. Maybe your boss just shot down your idea for some new innovation, or you took on an unprecedented project and things went south. Now the customer is angry and calling every day demanding to know what you are going to do to correct the situation. The easy solution is to just pack your bags and head to greener pastures. Why risk failing again? You obviously don’t have the abilities, skills, or intelligence to succeed in this. That is how I felt driving home that day. I just wanted to give up. Find an easier route to climb, one that I knew I could get up. I did not want to hear my friend’s encouragements any more. I wanted to hear their congratulations. I decided then and there I was done. I was going to find easier climbs that were in my range. My resolve only lasted a couple of days. A week later I was back at the bottom of that horrible route, tying into my rope. I took a deep breath and started up. When I got to the point where I always fell I stopped and closed my eyes. I took two deep breaths, opened my eyes, and made the lunge once again. When my fingers touched the hold I prepared my mind for the fall. Except it never came. As I sat at the top of that cliff relishing in my apparent victory I thought about the journey I had gone through to get there. I came to the realization that the journey, not the victory, had been the true reward. I learned that day the most important thing about trying impossible things is not letting the inevitable failures define you. The most important thing to learn is how to persevere through failure. So my challenge to you is to go back to that thing you failed at and try it again. Keep trying. Don’t fixate on overcoming the challenge, but use each iteration as an opportunity for personal growth and learning.